No summer cookout is complete without the right condiments, as evidenced by the growing number of condiment varieties filling grocery aisle shelves. Whether topping burgers and hot dogs with nacho cheese, slathering ribs with barbecue sauce or stirring mayonnaise or dressings into potato salad or coleslaw, the right sauces can add some flair to just about any dish. More artisanal and cultural options are also entering the market, including aiolis, avocado spreads, sriracha sauces, adobo, tandoori, Greek yogurt-based dips, Asian-inspired flavors and other global influences. Market growth in the U.S. for condiments has been strong and is expected to climb over the next few years. An area of focus for many food manufacturers is offering more nutritional options to meet consumer demands. Many condiments that contain eggs, cream, cheese and other rich ingredients are coveted for their flavors but are notoriously loaded with fat. An otherwise hearty bowl of vegetables, for example, can easily turn into an unhealthy, calorie-laden dish. Consumers continue to look for options that are lower in fat and calories, and food manufacturers need to respond to these demands to maintain market share. Reformulations of the past that attempted to reduce fat and calories often resulted in reduced flavors and textures. And even those food manufacturers that found success with their lower fat options are now considering reformulating because of consumer demands for clean labels, transparency and mindfulness about where their food comes from. Grande Custom Ingredients Group has helped many food manufacturers reformulate their creamy sauces, dressings and other condiments by replacing traditional ingredients such as eggs and high-fat dairy with alternative clean-label solutions — all while maintaining or improving flavors and textures. 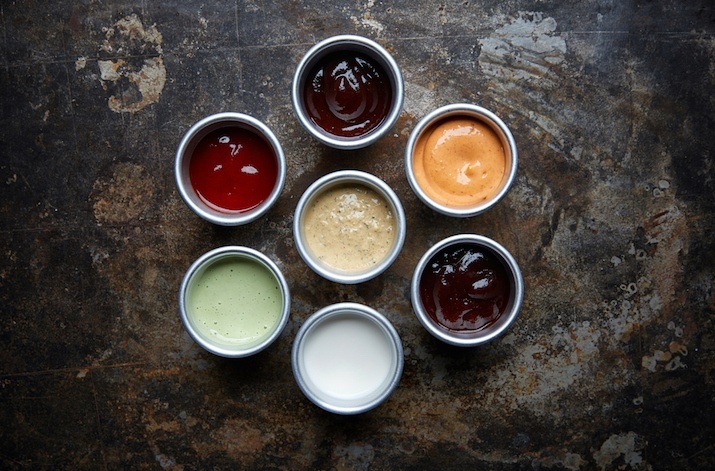 Here are two practical options to consider when formulating creamy condiments. Health-conscious consumers often reach for yogurt-based dressings and sauces, with Greek yogurt being the flavor of choice. In fact, Greek yogurt market share now surpasses regular yogurt. But food manufacturers that use fresh yogurt in their applications are challenged with short shelf lives, refrigeration and permit requirements, and potential contamination risks. Grande Primo is real yogurt in dried form. It’s a shelf-stable ingredient that provides the signature tart flavor profiles and creamy texture of traditional yogurt, but without the challenges of using fresh ingredients. Use it in dips and salad dressings, or bring a new twist to old classics such as potato salad or coleslaw. Maintaining a product’s natural mouthfeel, texture and flavor while eliminating or reducing costly eggs, cream, butter, cheese or fat can be problematic for food scientists. Volatile egg and dairy markets often rob profits and, while many alternatives may reduce costs, fat and calories, the flavors and viscosity are often disappointing. Grande Bravo functional whey protein overcomes these challenges by providing a shelf- and price-stable replacement for these traditional ingredients. Its impressive gelation properties and various flavor profiles can be used in a wide variety of cold- and heat-processed condiment applications. Some examples of common products that use Grande Bravo include cheese sauces, dressings, mayonnaise, vegetable dips, spreads, hummus and a wide range of other condiments. Capture the condiment craze and market share by formulating with clean-label solutions that help ensure all the flavors and textures consumers look for remain intact. Reach out to the food scientists at Grande Custom Ingredients Group to explore how these innovative ingredients can help transform your applications and provide a significant return on investment. To learn more about how you can mitigate the risks of rising costs and actually improve your formulations by using alternative ingredients, check out the free guide below.